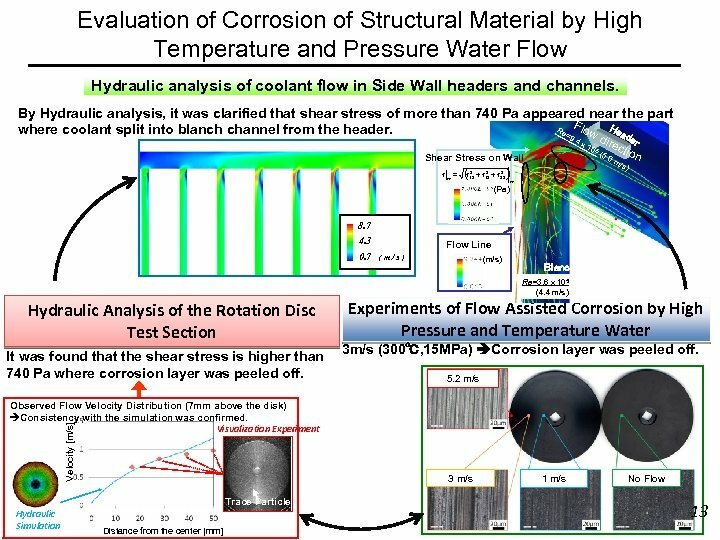 XRD profiles and EPMA analysis for clarification of sintering temp. 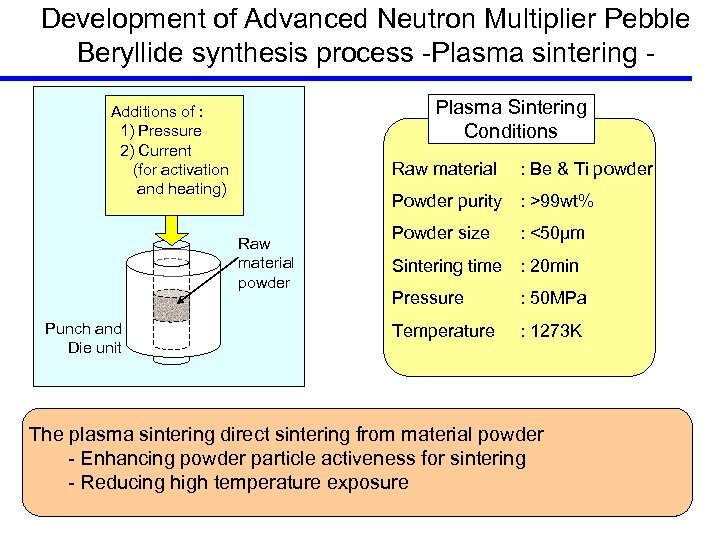 Be 2 Ti Be Be : 2% Beryllides: 98% [at 1273 K] Be 12 Ti Be 17 Ti 2 (Beryllides: Be 12 Ti, Be 17 Ti 2 and Be 2 Ti) (1) It was shown that spark plasma sintering is applicable for synthesis of Be 12 Ti. 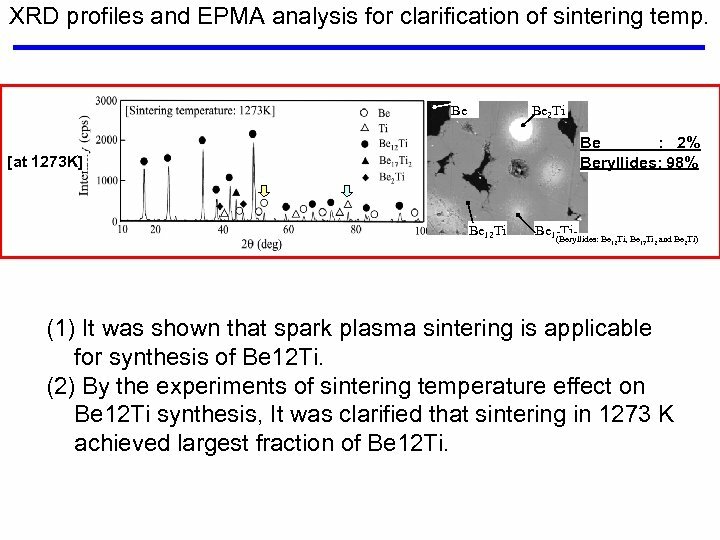 (2) By the experiments of sintering temperature effect on Be 12 Ti synthesis, It was clarified that sintering in 1273 K achieved largest fraction of Be 12 Ti. 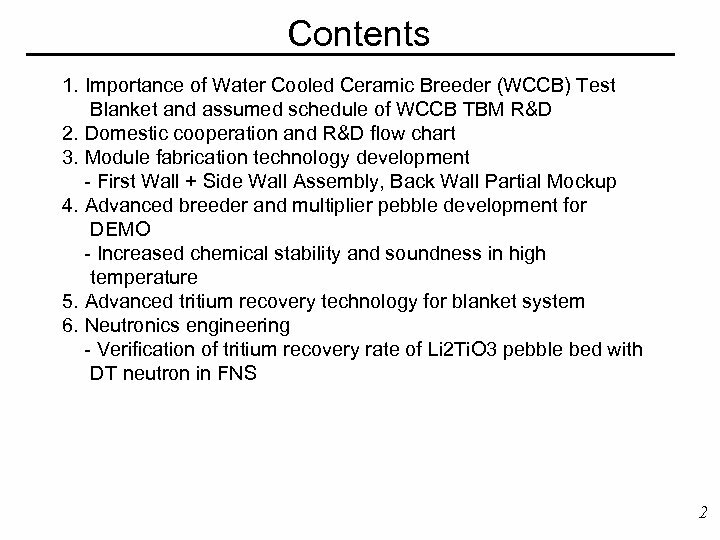 Development of Pebble Fabrication Technology of Li 2 Ti. 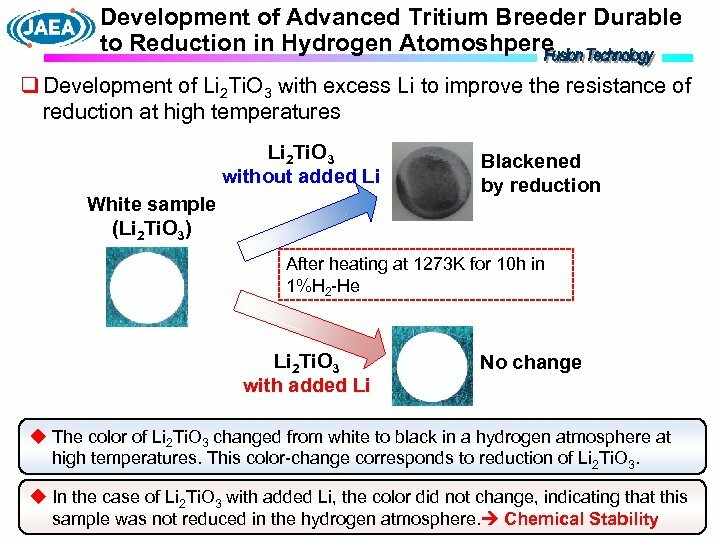 O 3 with excess composition of Li q Trial fabrication of pebbles of Li 2 Ti. O 3 with excess Li composition by sol gel method Raw material Li. OH • H 2 O and H 2 Ti. O 3 Gelation Granulation Slurry Li 2 Ti. O 3 with excess Li Diameter Water Gel Li 2 Ti. O 3 with excess Li Sintering 1. 18 mm Sphericity 1. 04 Gel-spheres Density 89%T. D Grain size 2 - 10μm u Li 2 Ti. O 3 with excess Li was synthesized from mixed Li. OH • H 2 O and H 2 Ti. O 3 u Pebbles of Li 2 Ti. O 3 with excess Li was granulated by sol gel method from slurry. 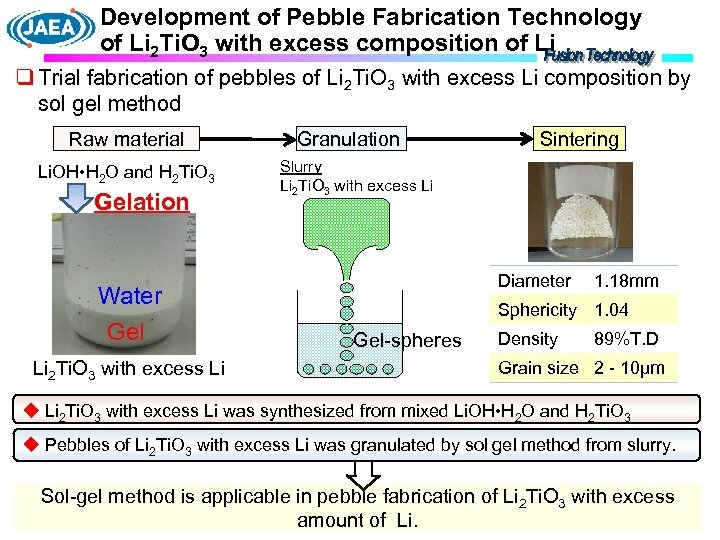 Sol-gel method is applicable in pebble fabrication of Li 2 Ti. O 3 with excess amount of Li. 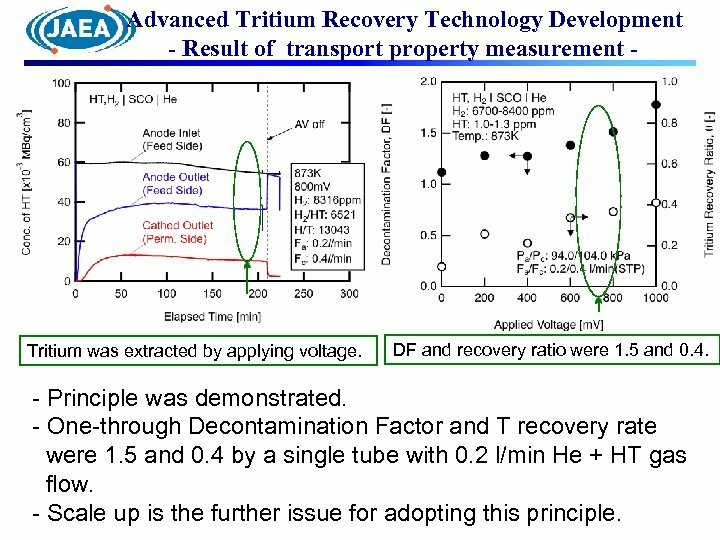 Advanced Tritium Recovery Technology Development - Result of transport property measurement - Tritium was extracted by applying voltage. DF and recovery ratio were 1. 5 and 0. 4. - Principle was demonstrated. - One-through Decontamination Factor and T recovery rate were 1. 5 and 0. 4 by a single tube with 0. 2 l/min He + HT gas flow. 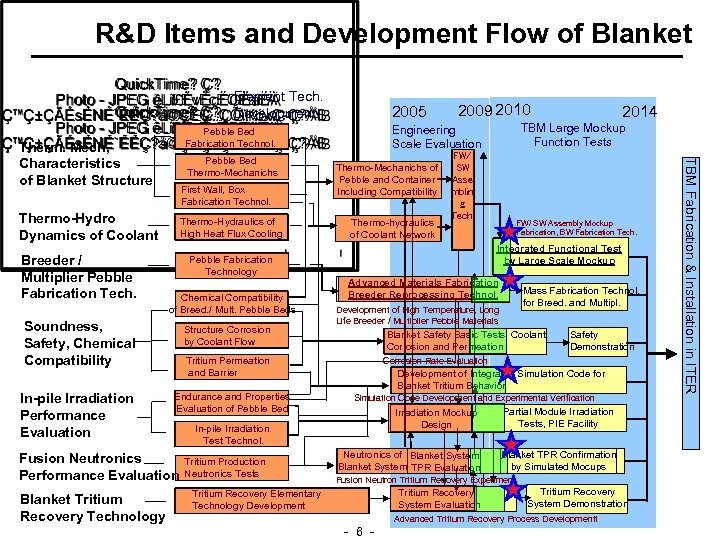 - Scale up is the further issue for adopting this principle. 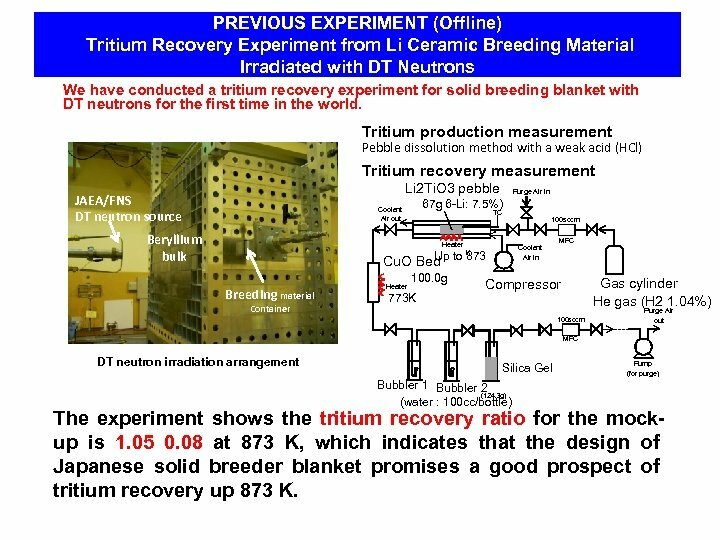 PREVIOUS EXPERIMENT (Offline) Tritium Recovery Experiment from Li Ceramic Breeding Material Irradiated with DT Neutrons We have conducted a tritium recovery experiment for solid breeding blanket with DT neutrons for the first time in the world. 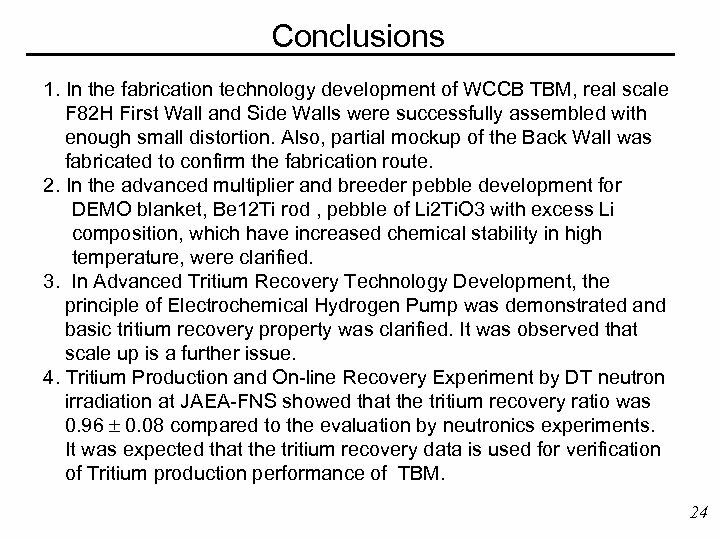 Tritium production measurement Pebble dissolution method with a weak acid (HCl) Tritium recovery measurement Li 2 Ti. 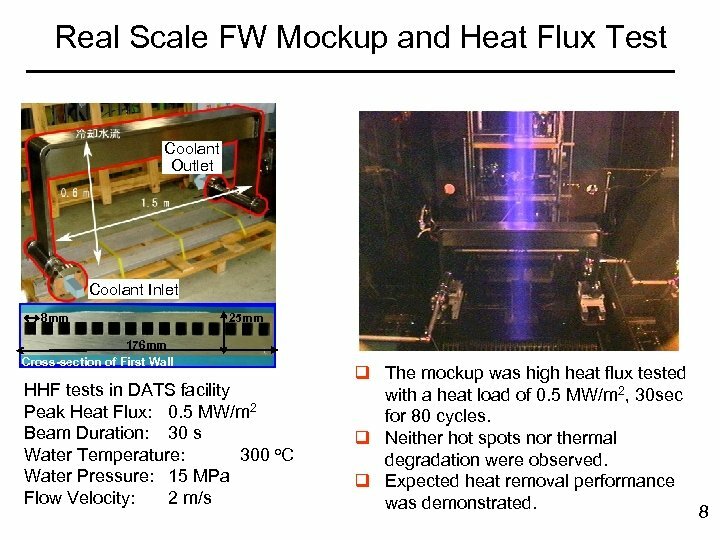 O 3 pebble JAEA/FNS DT neutron source Coolant Air out Beryllium bulk Purge Air In 67 g 6 -Li: 7. 5%) TC Heater Coolant Air in K Up Cu. O Bed to 873 Breeding material Container Heater 100. 0 g 773 K 100 sccm MFC Gas cylinder He gas (H 2 1. 04%) Compressor 100 sccm Purge Air out MFC DT neutron irradiation arrangement Silica Gel Bubbler 1 Bubbler 2 (124. 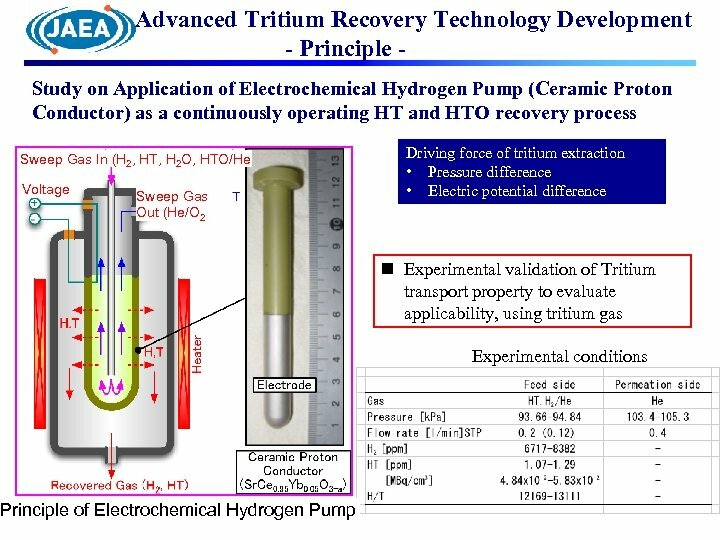 3 g) (water : 100 cc/bottle) Pump (for purge) The experiment shows the tritium recovery ratio for the mockup is 1. 05 0. 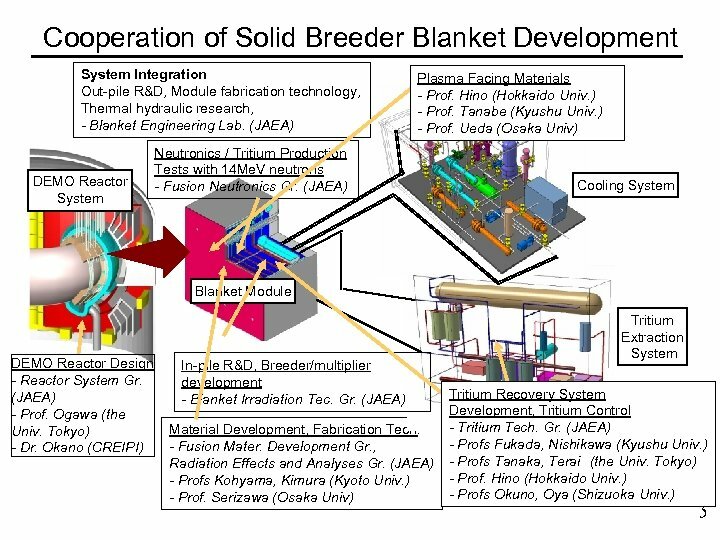 08 at 873 K, which indicates that the design of Japanese solid breeder blanket promises a good prospect of tritium recovery up 873 K.
Experimental Setup for On-line Measurement of DT Neutron Production Experiment Li 2 Ti. O 3 Pebble Bed (6 Li 7. 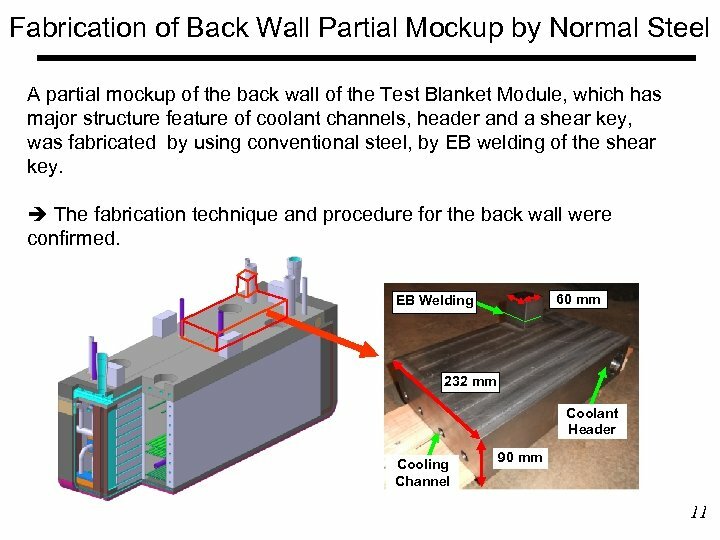 5%) Heater Concrete Wall (2 m thick) MFC 100 cm 3/min Former Trap Be Block Assembly Bottles for HTO (H 2 O DT Neutron Source 100 cm 3/bottle) (1. 5 x 1011/n/sec) Gas Cylinder (He+H 2 1. 04%) Cu. 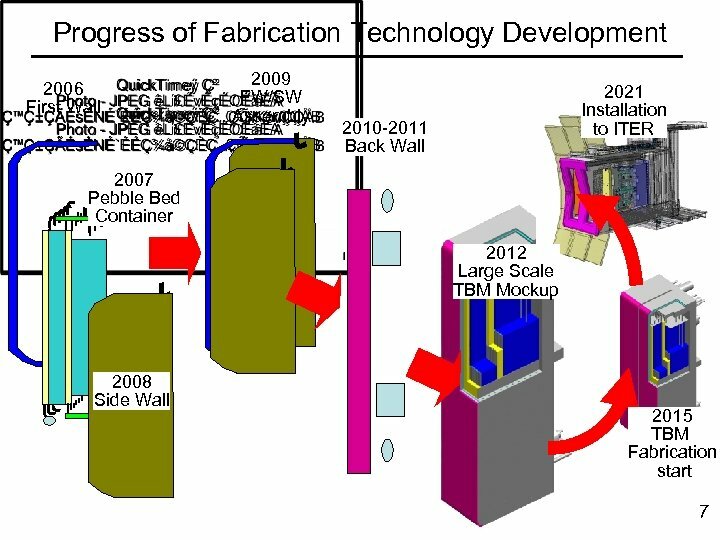 O Bed (100 g) For Oxidization of HTO Trap bottle change by remote handling Exhaust Gas Latter Trap Bottles for HTO (H 2 O 100 cm 3/bottle) JAEA/FNS DT neutron source Beryllium bulk Breeding material Container DT neutron irradiation experiment Breeder capsule arrangement Schematic view of the DT Neutron Tritium Recovery Online Experiment • • The neutron intensity was about 1. 5 x 1011　neutron/sec. The sweep gas He + H 2 1. 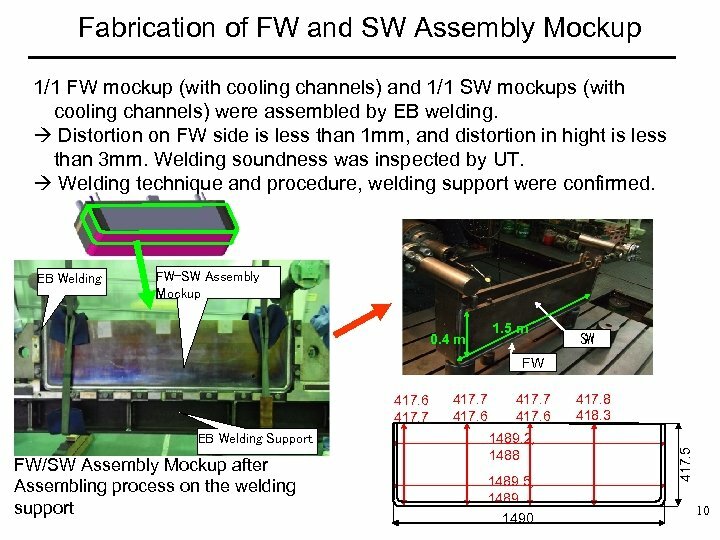 04% flow rate kept 100 standard cm 3/min After the irradiation, water vapor fraction in the sweep gas line was measured with a dew-point meter. It was an order of 1000 ppm. After the run, 1 cm 3 water in each trap bottle was mixed into a liquid scintillator and measured with a liquid scintillation counter (LSC), which was calibrated with a standard HTO (50 Bq/cc) sample within 2 % accuracy. 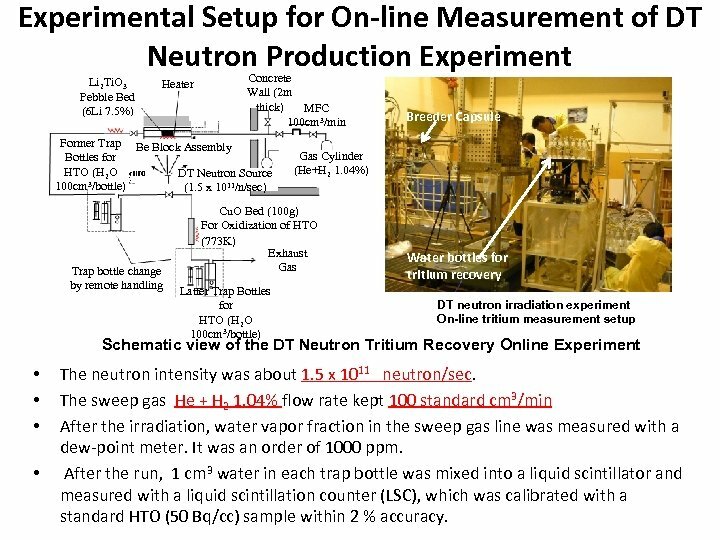 Experimental Setup for On-line Measurement of DT Neutron Production Experiment Li 2 Ti. O 3 Pebble Bed (6 Li 7. 5%) Heater Concrete Wall (2 m thick) MFC 100 cm 3/min Former Trap Be Block Assembly Bottles for HTO (H 2 O DT Neutron Source 100 cm 3/bottle) (1. 5 x 1011/n/sec) Trap bottle change by remote handling Gas Cylinder (He+H 2 1. 04%) Cu. 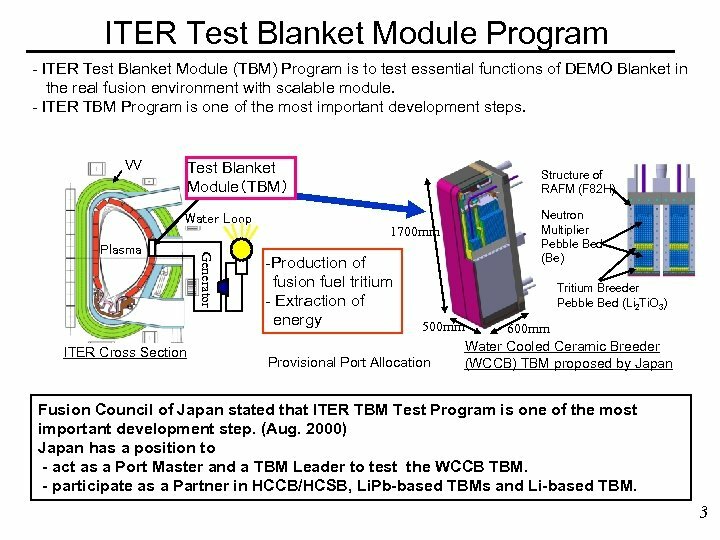 O Bed (100 g) For Oxidization of HTO Heater (773 K) Exhaust Gas Latter Trap Bottles for HTO (H 2 O 100 cm 3/bottle) Breeder Capsule Water bottles for tritium recovery DT neutron irradiation experiment On-line tritium measurement setup Schematic view of the DT Neutron Tritium Recovery Online Experiment • • The neutron intensity was about 1. 5 x 1011　neutron/sec. The sweep gas He + H 2 1. 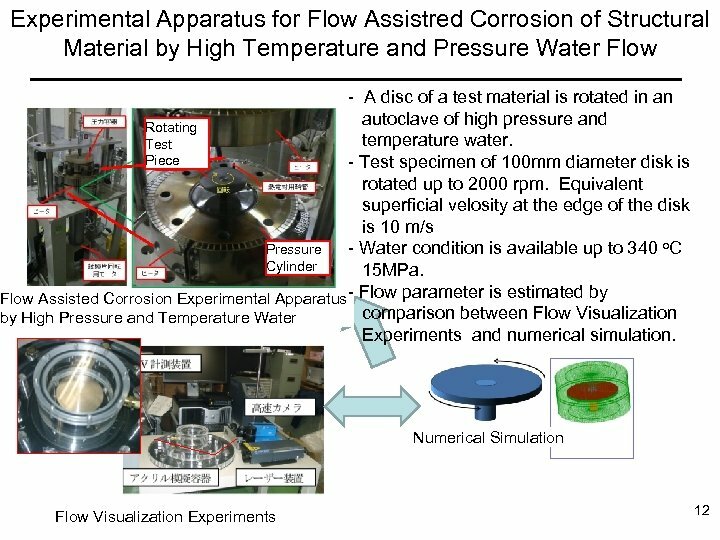 04% flow rate kept 100 standard cm 3/min After the irradiation, water vapor fraction in the sweep gas line was measured with a dew-point meter. It was an order of 1000 ppm. After the run, 1 cm 3 water in each trap bottle was mixed into a liquid scintillator and measured with a liquid scintillation counter (LSC), which was calibrated with a standard HTO (50 Bq/cc) sample within 2 % accuracy. Result Fraction (per total tritium Bq) The total tritium radioactivity was about 8. 66 k. Bq. 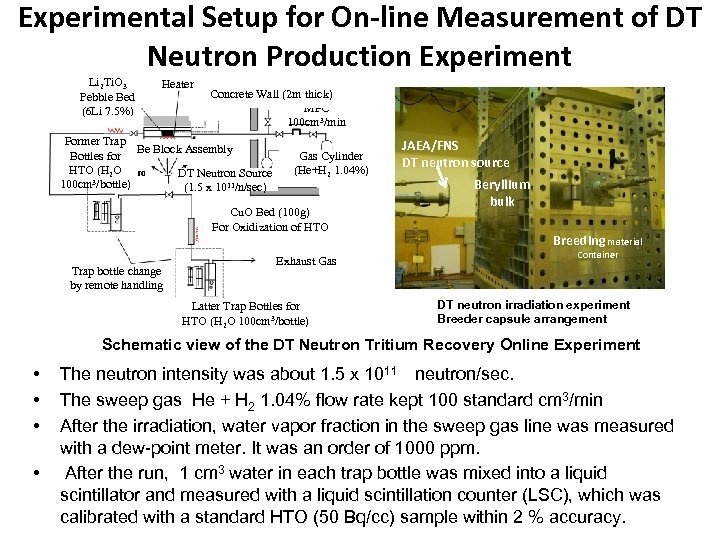 The number of DT neutron irradiation was 1. 74 x 1015. Thus the TRR was 7. 11 x 10 -14 Bq/g/DT neutron (normalized in Li 2 Ti. O 3 weight and neutron flux) Temperature 573 K 0. 3 0. 2 HTO HT DT neutron irradiation TRR/TPR =0. 96 Total T = 8. 66 k. Bq HTO 0. 1 HT 0. 0 -1 0 1 2 3 4 5 6 Irradiation time (hour) 7 The horizontal axis is elapsed time of tritium recovery and the vertical one is fraction of recovered tritium radioactivity 8 In order to deduce the tritium recovery ratio, we adopted our previously measured TPR data, 7. 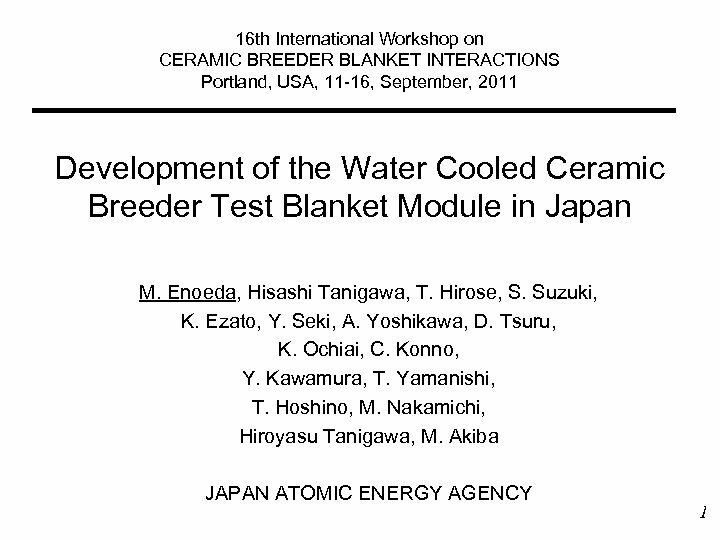 46 x 10 -14 Bq/g/DT neutron with experiment error of 8 %. 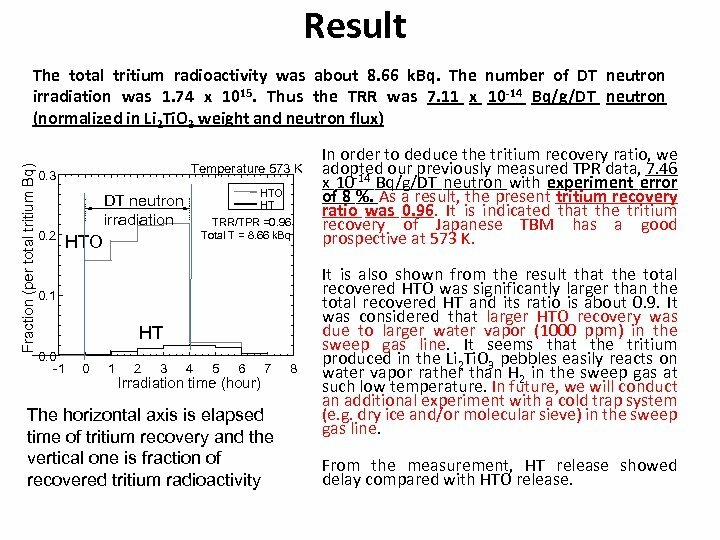 As a result, the present tritium recovery ratio was 0. 96. 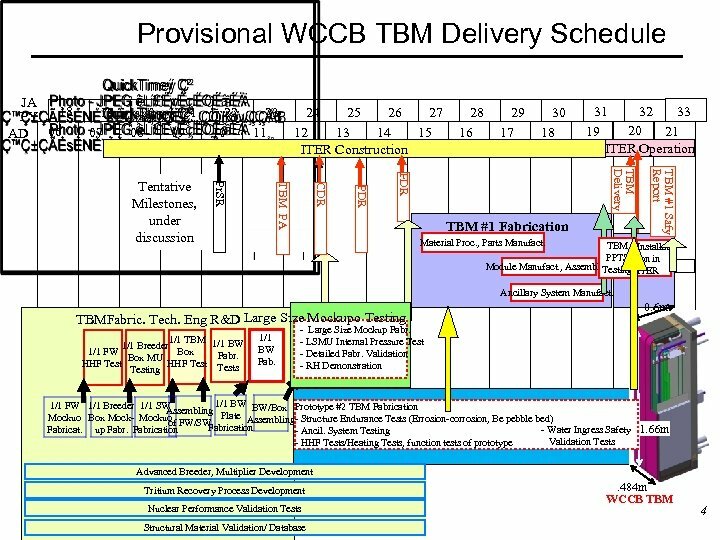 It is indicated that the tritium recovery of Japanese TBM has a good prospective at 573 K. It is also shown from the result that the total recovered HTO was significantly larger than the total recovered HT and its ratio is about 0. 9. It was considered that larger HTO recovery was due to larger water vapor (1000 ppm) in the sweep gas line. It seems that the tritium produced in the Li 2 Ti. O 3 pebbles easily reacts on water vapor rather than H 2 in the sweep gas at such low temperature. 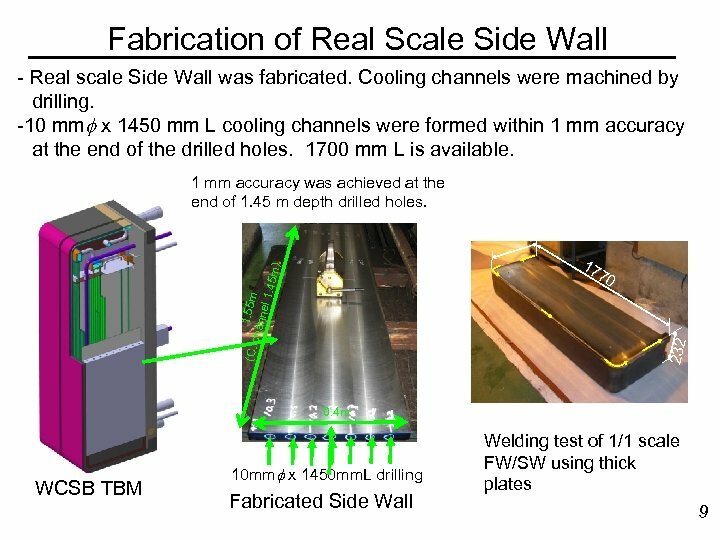 In future, we will conduct an additional experiment with a cold trap system (e. g. dry ice and/or molecular sieve) in the sweep gas line. From the measurement, HT release showed delay compared with HTO release.